Three empty kayaks carried off on a tide from a Wester Ross loch have been found - one 75 miles (120km) away. The family using the craft alerted the coastguard and police to the incident at Loch Torridon on 18 October. One of the kayaks was found nearby on the same day. A second drifted 70km across the Minch to Plocrapol on south Harris where it was found 10 days later, and the third was located four days later having travelled all the way past Cape Wrath. Inverness-based consultant engineer Graham Doig and his family had hired two of the kayaks. One was found less than a mile away and the other was spotted about 120km away north east of Cape Wrath in Sutherland by a cargo vessel. Lochinver lifeboat crew managed to recover the craft. 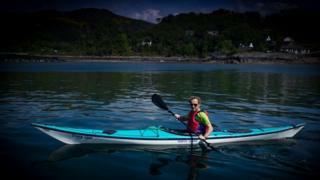 The third kayak, which belonged to Mr Doig, was found on Harris 10 days after it was lost. The family had left the three kayaks above the high water mark at Lower Diabeg on Loch Torridon while on holiday there. However, on 18 October, a higher than expected tide carried the craft away. The family made the police and coastguard aware in case a member of the public spotted the empty kayaks and mistakenly believed people were in difficulty. Mr Doig said: "I was really concerned about my own boat as it was fibreglass and less robust than the plastic hire boat, it is very fast but also very light so would get blown easily by the wind, which was in the east. "I did expect it to go in the direction of Skye but then was concerned it may pass the Western Isles and head out to the Atlantic." Coastguard officer Murdo Macaulay said two of the kayaks had travelled "notable" distances. He added: "Evidently the second kayak must have drifted out into the Minch and then been carried by wind and tide northwards missing the entire west coast mainland on its journey."